Back in the mid 70’s, there wasn’t much awareness of the impact of building construction on water quality. And like the owners of this project, people were able to get amazing views by building their houses right on the edge of a creek or river. Today, you would never be able to build this close to a natural water body, and for good reason. We all know now how important it is to protect our natural resources, most importantly, the Chesapeake Bay. And one of the biggest problems facing the bay is the impact of increased construction within the Chesapeake Bay watershed. In 1988, Virginia adopted the Chesapeake Bay Preservation Area Ordinance to help protect the bay. The act established a 100-foot set back from any natural water body within the Chesapeake Bay watershed. These buffers were designated as RPA’s or Resource Protection Areas, and construction was no longer permitted in those areas without an official waiver. 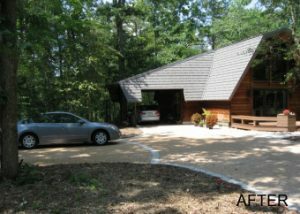 Since the house was built entirely within an RPA, there were a lot of restrictions and complications to deal with. 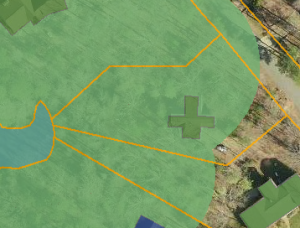 The cross-shaped house is built entirely within the green 100′ RPA zone. Luckily for the clients, because the house predated the Bay Act, they could rebuild or renovate any part of the building that was within the existing footprint of the house. But for areas beyond the original footprint, like the enlarged front deck and new walkways, Hertzler & George had to go through a permit process with James City County. This involved calculating the square footage of all the proposed construction outside of the original building footprint and installing mitigation plantings using a standard County formula. The new native plantings help absorb excess runoff from the newly created impervious areas. The back deck had a gorgeous view of a small tributary of the James River. But it had to be removed when foundation repairs were made to the house to address problems caused by the dreaded shrink/swell soil we have in our area. Luckily, the footprint of the original deck was fairly large and it wasn’t necessary to get permission to rebuild it. 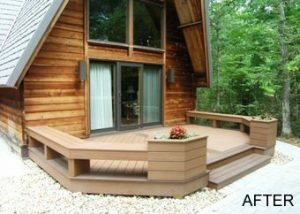 Because we wanted to preserve as much of the view from the back deck as possible, we decided to use a cable rail system by Railing Works. Once installed, the cable railing was about as unobtrusive as we could get. 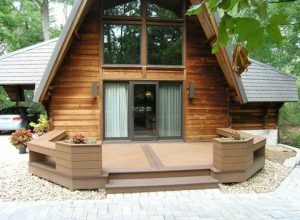 For the decking, the clients decided to go with a composite product over wood because of durability and reduced maintenance. 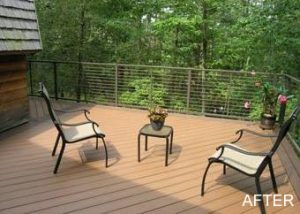 We looked at a few possible manufacturers and ended up going with Azek decking. Working with the client, we came up with a pattern of diagonal boards with contrasting banding. 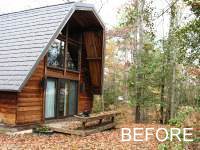 Unlike the back, the clients did want to enlarge the front deck, which required getting permission from the County. H&G’s built-in seating and planters help to create the feeling of an outdoor room. There were a couple of problems to address at the side of the house. There was an existing dirt path winding down a steep slope that was especially treacherous in the fall when it was covered with wet leaves. 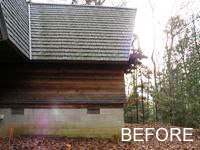 And there was a fair amount of erosion caused by rainwater falling off the steep roof. 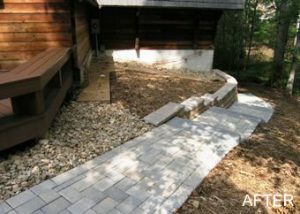 To provide better access to the basement storage area, Hertzler & George installed a concrete paver walkway with steps and a low curving retaining wall. The wall was also part of a system of ground gutters and drain pipes that helped address the erosion and channel the water away from the foundation. 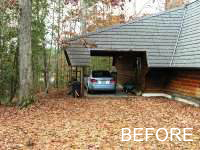 In the front of the house, the clients, who were now getting older, were having difficulty navigating the cramped gravel driveway, and there was no truly defined parking area. H&G designed a new drive and parking court that gives them ample space for maneuvering their car. The clients chose an exposed aggregate finish, and to add some visual interest, we edged it with contrasting concrete edgers. 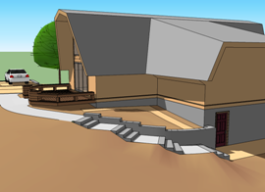 Because the project involved multiple levels and varying slopes, we decided that it would be helpful to create a 3D model during the design process (click here to learn more about 3D modeling). 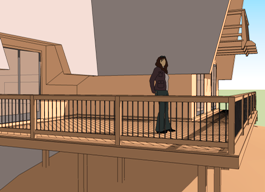 The SketchUp software H&G used was crucial for helping the clients visualize how all the pieces of the design worked together, and they were able to look at several different options from whatever view they wanted. They also enjoyed playing around with the software themselves to try out different colors and material patterns. Do you have similar issues with RPA areas? 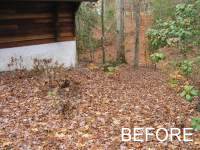 Perhaps you need to expand a deck or you want install a path down to lake. Or maybe you need native plantings to stabilize an eroding slope. 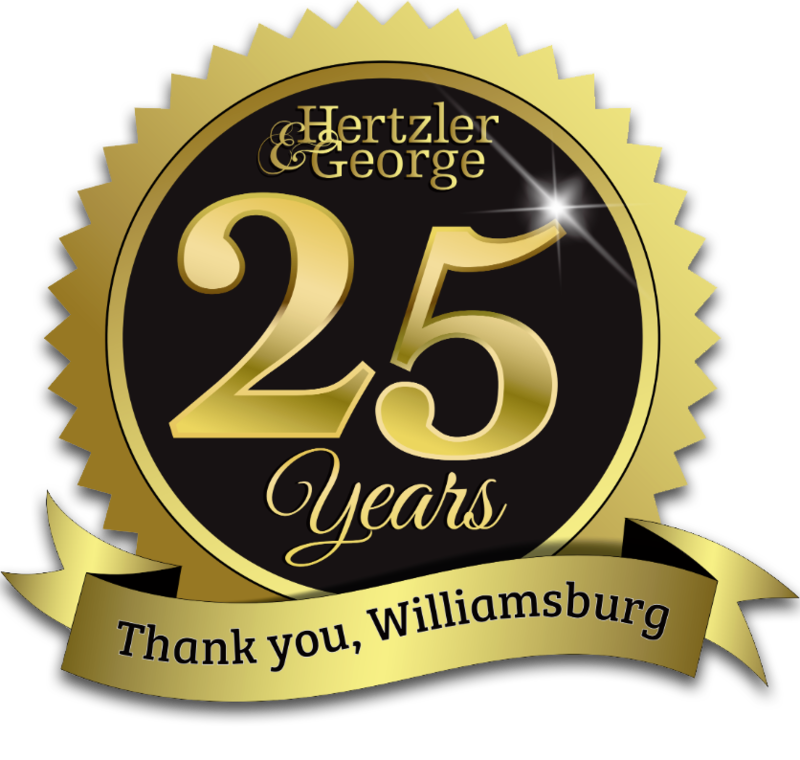 Hertzler & George can help you through every step of the permit process and get your project built. Give us a call!